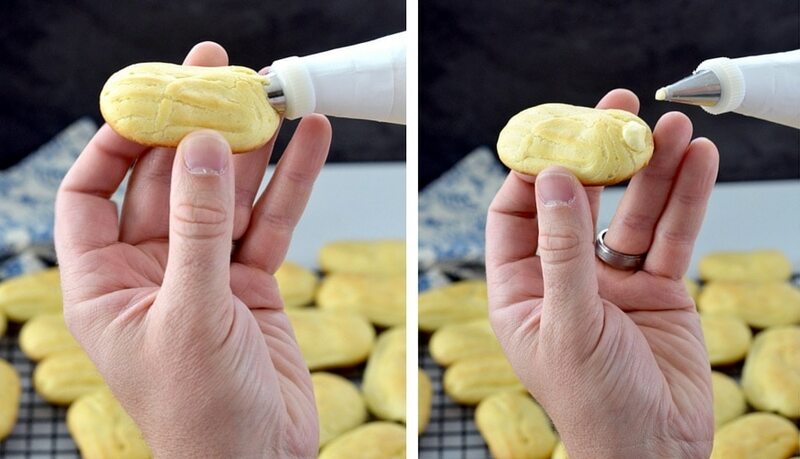 This is seriously the Best Eclairs Recipe ever! The pastry and frosting are made completely from scratch and the filling is absolutely to-die-for! Making this recipe is a labor of love, but it results in a delicious, elegant dessert that is perfect for any special occasion! Make-ahead and freezer-friendly! When he starts dreaming about his [future] glory days…I always suggest that we make every year the best year ever. We usually come to an agreement and move on! (Phew) 😉 This Best Eclairs Recipe is Ritch’s favorite dessert of all time. His mom has been making these homemade Eclairs for as long as he can remember! Now listen, these Eclairs are good, like knock-your-socks-off delicious. But they are hard work! Making these for my husband is truly a labor of love. He’s totally worth it (like totally) and I happily spend half a day making these for Ritch because they bring him so much joy! We always work as a team, which makes the process faster and more fun! There are three separate components that make this truly the best eclairs recipe EVER. Since each part requires the use of a standing mixer, I have the process of making of these mini eclairs down to a science! 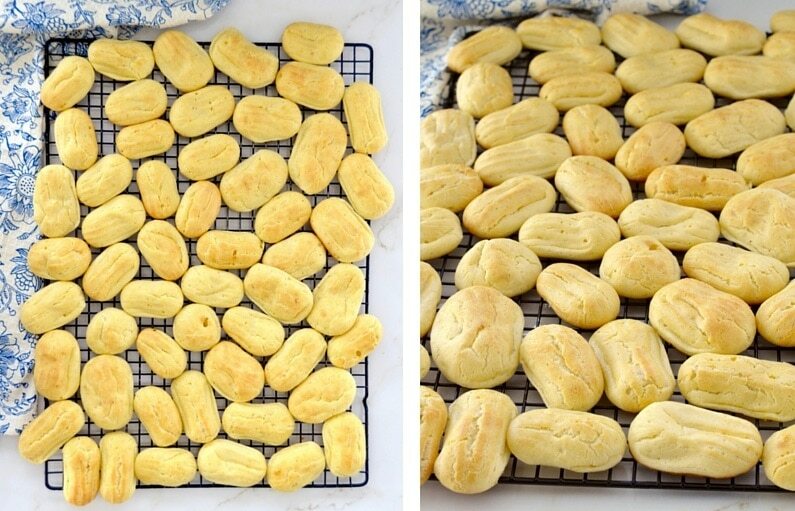 This best eclairs recipe begins with making the pastry filling because! Since involves chilling and whipping, it’s important to start with ti first! Begin by whisking together the milk and pudding mix, then letting it set up in the fridge for 5 minutes while you whip the whipping cream. A helpful tip: when you whip the whipping cream in your standing mixer, start by placing the mixing bowl in the fridge or freezer. A cold bowl aids in the whipping process immensely! After the pudding is set up and the cream is whipped, gently fold them together. Once they’re thoroughly combined, cover your filling and place it in the fridge while you make the puffs and frosting! You will definitely have extra filling…but trust me you won’t be sad about it. True and important story! My husband knows this recipe SO well, that one time I made it using a generic brand of French vanilla pudding and he noticed. So much that he said, “What did you do to these? They are different!” First, I had to fight the urge to say something super mean because I had spent so (so) long making them (as you will see if you make it to the end of this post)! I was indignant because I made them the same way I always do! Then, (oh yes…then) Ritch found the generic pudding packages in the garbage and said, “You didn’t use Jell-O brand pudding! That’s it! The filling is different!” LOL LOL! I about died. That man can’t tell the different between ground turkey and ground pork, but he could detect that I tried to save 90 cents by buying a different brand of pudding. Never again did I make that mistake. Check out the picture below of the finished eclair filling! 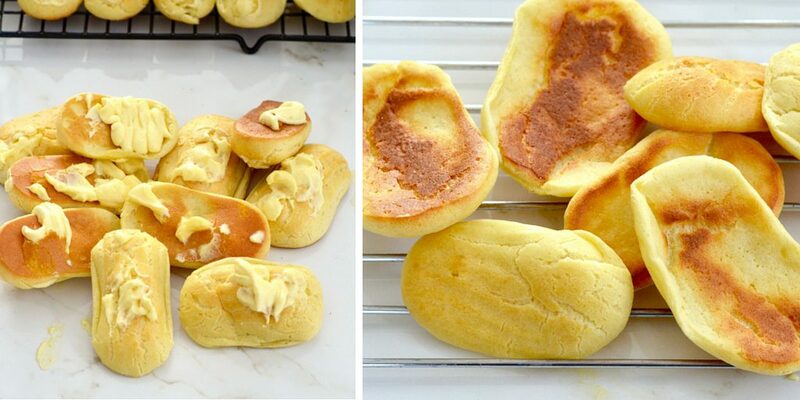 Once the eclair filling is chilling in the fridge, it’s time to make the pastry shells (or puffs as we call them)! 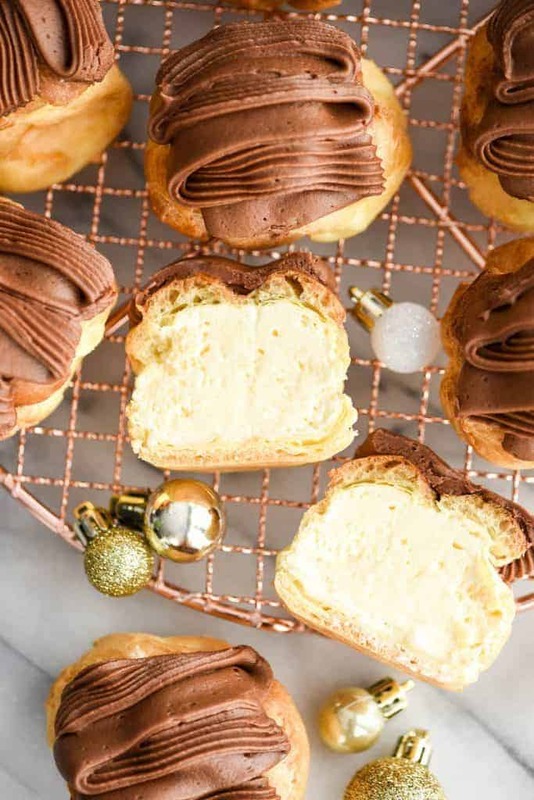 This Choux pastry is pretty straightforward…but one thing you need to be sure of is that your final batter is not too runny. If the batter is too runny, don’t worry it can be fixed! If the batter is not thick enough to hold its shape when piped, you will need to add more flour. I have had to adjust the amount of flour if my eggs are larger than normal and my batter comes out too thin (which happened to this very batch)! Use a decorator’s bag and Wilton #1M tip to pipe the batter onto a greased baking sheet. Personally, I think the lines that the #1M tip makes are pretty! If you’d prefer smooth shells use a circular tip, like the Wilton #1A tip! You can make them into circles or oblong shapes (both pictured in this post)! The eclair shells will stick to the parchment paper and will be a nightmare to remove! Bake the pastry shells until they are golden brown but not too dark (about 20 minutes). This recipe makes about 50 or 60 shells that are 2″ long. After they are finished baking, remove them to a wire rack to cool. The shells need to be completely cool before filling/frosting. However they are fairly thing and cool pretty quickly. While your shells are baking, make the frosting. It’s a basic chocolate buttercream frosting that is a little on the dark side (insert Star Wars jokes here). This is the only component that you will not have extra of. Every.single.time that I make this recipe I’m concerned that I won’t have enough to frost all the Eclairs. But it always ends up being just the right amount (you’d think I’d learn…right)? 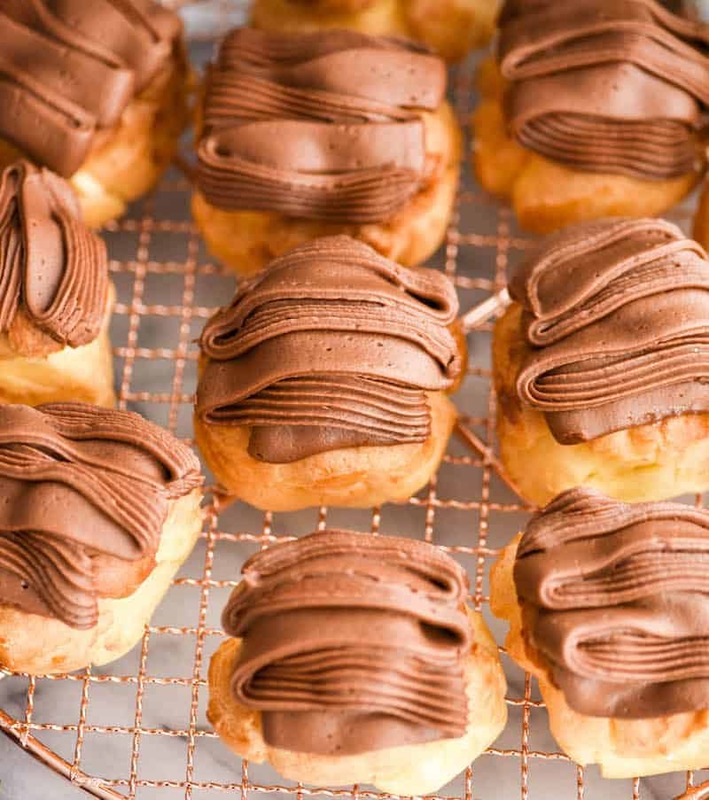 To assemble the Eclairs, begin by piping the filling into the shells using a small round tip. 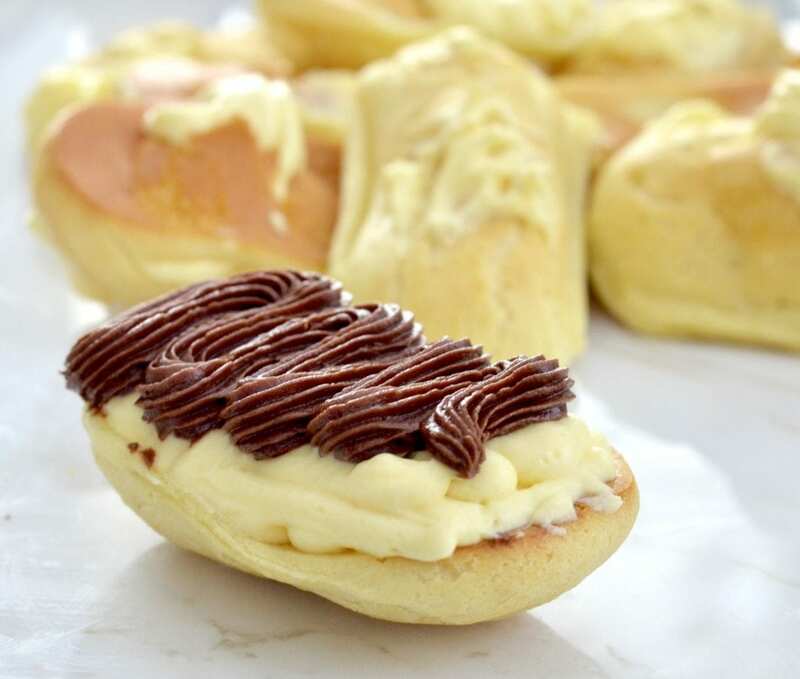 Using a tip is very helpful to ensure the homemade eclairs will be fully filled without making a mess. Press the decorators bag full of filling into one side of the cooled pastry shell, then gently push the filling out until you see it start to ooze out a little bit. We use a Wilton Star Tip to pipe the frosting on. But feel free to use your favorite tip to apply the chocolate frosting. I don’t recommend spreading the frosting onto the eclairs with a knife because the filled pastry shells are delicate! If you apply too much pressure you run the risk of crushing the eclair! Something that you absolutely have to know is that you will have “reject” eclairs. Seriously, you will get a handful of shells that decide not to puff up in the oven and turn out flat. Also, some of your puffs might look perfect, but will explode as you try to fill them! Don’t get discouraged if as many as 10 or 15 don’t work out for you. 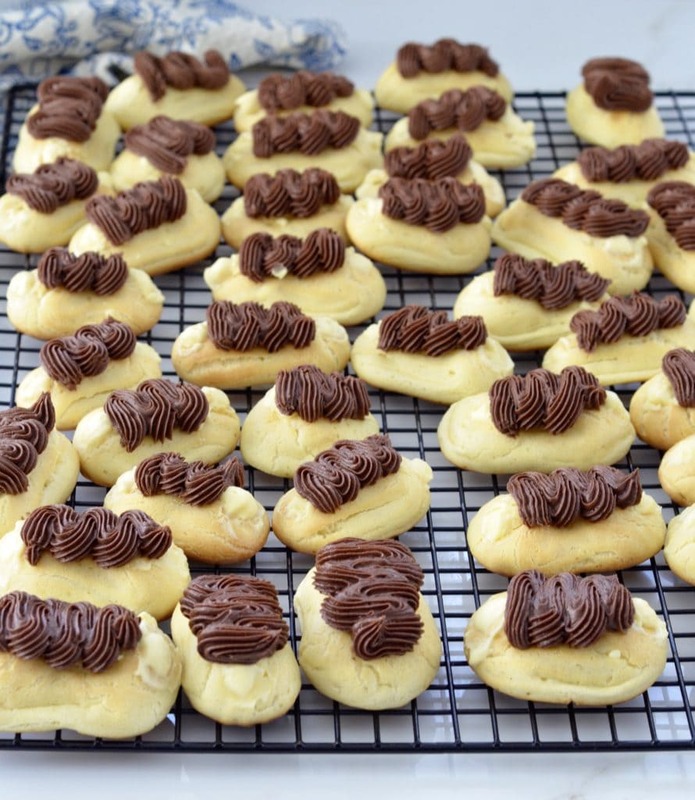 This recipes yields about 45 mini Eclairs, even with the rejects! Real life people! However, please (pretty please–my husband begs you) do not waste the less-than-perfect shells! You can use them to dip into the filling (seriously that’s what Ritch does), or to create masterpieces like this: I will call it the S.S. Eclair. YUM. Tools needed to make the Best Eclairs Recipe! Standing Mixer. A standing mixer is truly the powerhouse of this recipe. 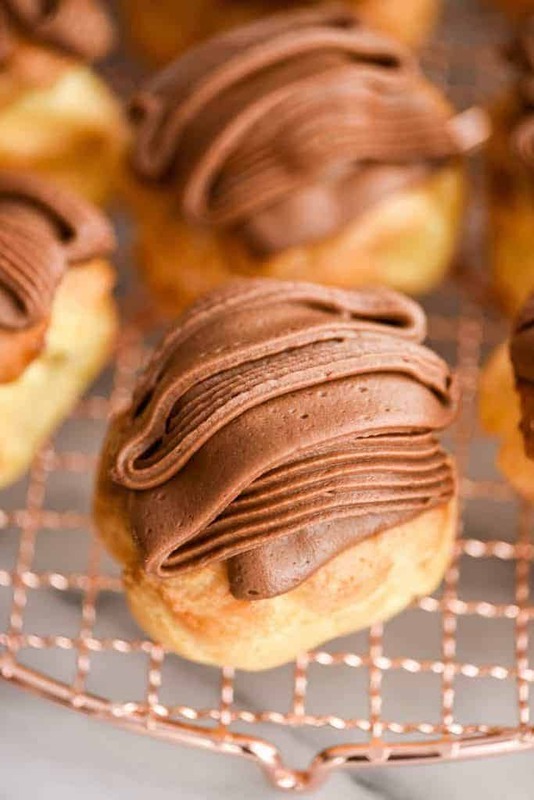 Sure you could make these homemade eclairs without it, but it will be WAY harder. I bought this Kitchen Aid mixer on a crazy awesome sale on Black Friday this year (online people…I’m not going into the store on black Friday…ever LOL)! Decorator’s bag. I use both reusable and disposable decorators bags. I have a hard time keeping the reusable ones clean, so I prefer disposable ones! Wilton 1M tip. I use this tip for EVERYTHING. Including making my favorite rose cake. Seriously, this is an absolute must-have if you enjoy baking and cake-making. Plus it’s only $4! Wilton Small Round Tip. This is used for filling the eclairs easily! Small star tip for piping on the chocolate frosting. If you are still with me here (thank you and I love you), you can see that this recipe is not for the faint of heart. 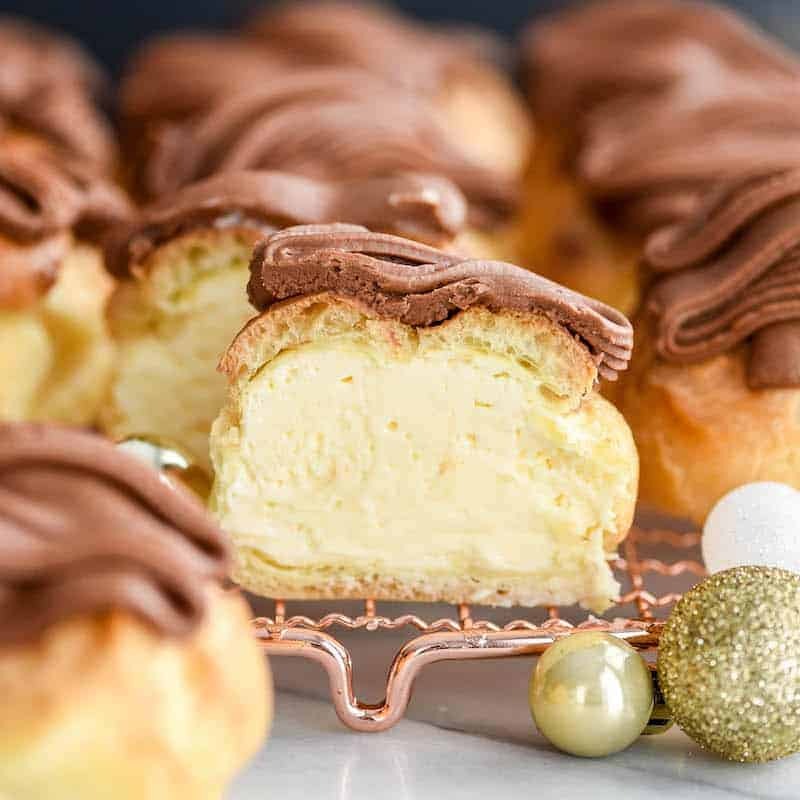 While these Eclairs are a tremendous amount of work (like SO much work) the end result is one of the best desserts on the planet and will make the recipient feel oh so very loved. Mix together the French vanilla pudding and milk. Set aside in the refrigerator until it becomes thick (about 5 minutes). 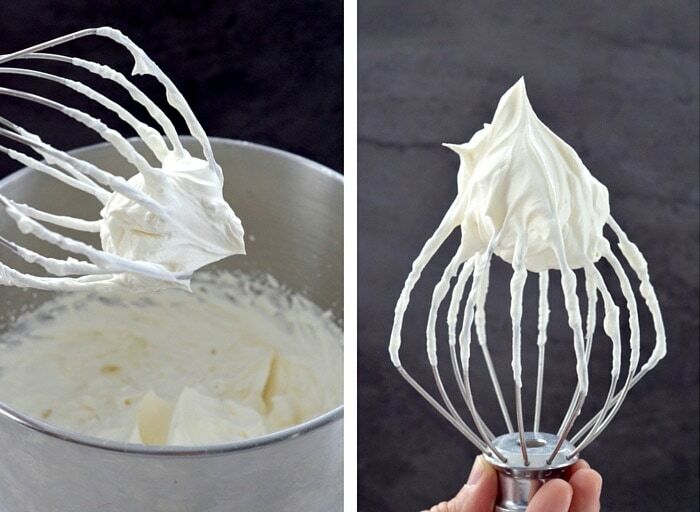 Pour the whipping cream into your standing mixer and whip on high speed until it becomes slightly thick and frothy. Add vanilla and powdered sugar and whip until firm peaks form and hold their shape. Fold the pudding and whipped cream mixture together. Cover and set aside in the refrigerator. Preheat oven to 400 degrees F. Grease three jelly roll pans and set aside. Measure your water, salt and butter into a 4-quart saucepan. Heat water salt and butter to boiling. Continue to boil the mixture until the butter is melted. Add the flour to the saucepan all at once and whip with wooden spoon. Mixture will form a ball in middle of the pan. Cool for about 5 minutes stirring to cool faster. Add eggs one at a time whipping with wooden spoon well after each. [Or transfer your mixture to a standing mixture and add eggs individually, beating well after each]. Check your batter, if it is not thick enough to hold a shape when piped, gradually add more flour until it reaches the desired consistency. 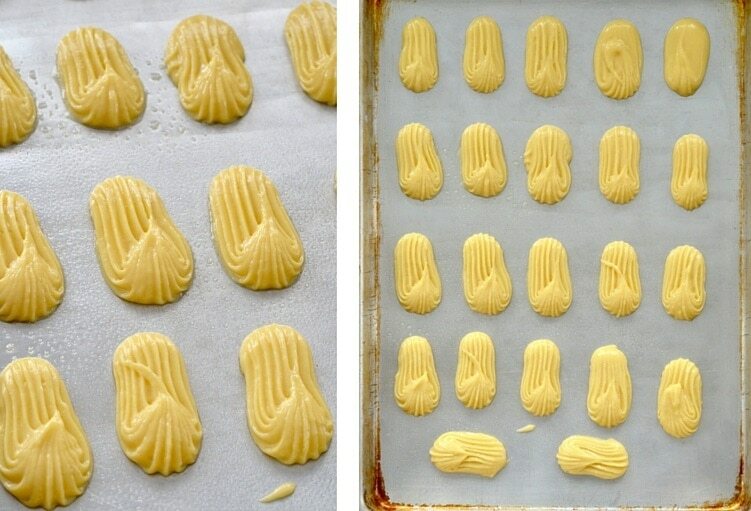 Put mixture into pastry bag and pipe out eclair shapes about 1 ½ to 2 inches long and 2 inches apart on your prepared baking sheets. Bake at 400 for about 25 minutes or until lightly brown. Let cool completely before assembling the eclairs. Melt chocolate over a double boiler or in the microwave (60 seconds, then 30 second intervals until smooth), set aside. 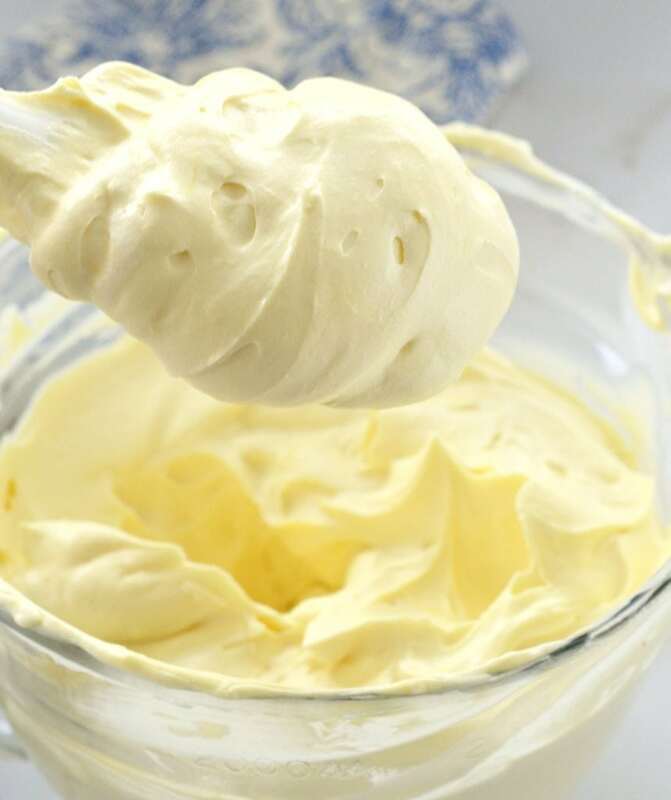 Place softened butter in the bowl of your standing mixer. Add chocolate vanilla and beat until combined. Add salt and powdered sugar and beat until well combined. Add milk and beat until the mixture reaches spreading consistency, wiping down the sides as you go. You may need to add more milk. Set aside (but keep at room temperature). Put filling in a large piping bag fitted with a small, round tip. Gently pipe the filling into one end of the pastry puff. Repeating for each puff until they are all filled. 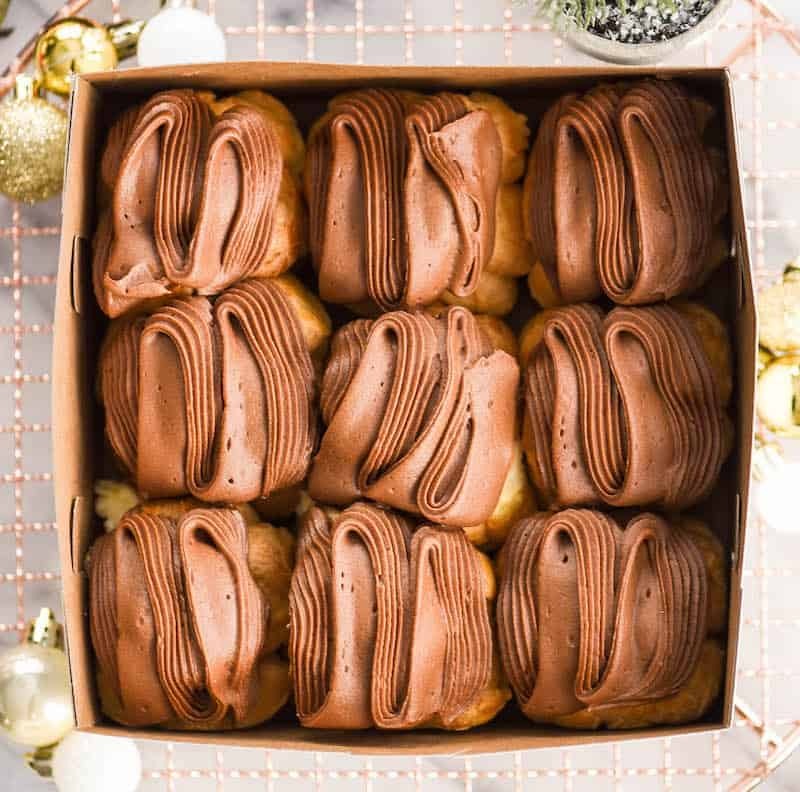 Fill a large piping bag with your chocolate frosting and frost the eclairs in any way you’d like! These eclairs freeze extremely well! Simply remove from the freezer and place in the refrigerator for at least 1 hour before serving! These are SO cute!!! I want to take a bite right out of my screen! Oh my goodness, these look incredible! Do you think they’d work with gluten free flour? Hey Stefani….wow I do not know the answer to that question! Honestly my gut reaction is no. If you wanted to give it a try I recommend that you start with the puffs and make 1/2 or even 1/3 of the recipe to see how it turns out (in case it doesn’t)! And I would use a gluten-free flour that was made to be a 1:1 replacement for unbleached, all purpose flour. If you try it PLEASE report back!!! WOW. These do look like a complete labor of love, and Laura, you just shine that love for your family. 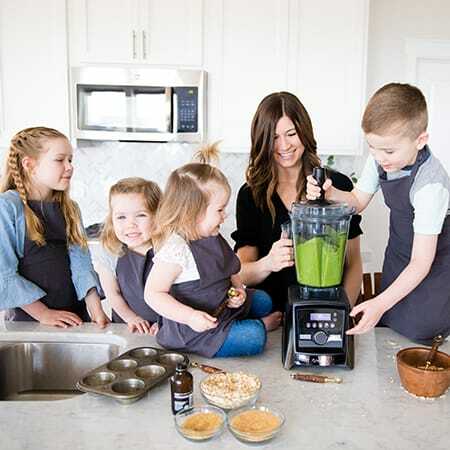 I’m so thankful God connected us, because I now have so many role models and sisters in Christ who are encouraging me by the way they serve their families through cooking with so much love. And I bookmarked this, because I think I would love to attempt it. I really have to set aside time to do it with care and compassion, because I’m often too ‘quick’ about cooking/baking (although I really like it), I tend to RUSH too much. This post was an encouragement to stop rushing and do more things in love. Thank you so much Emily! I am so grateful our virtual paths crossed too! 🙂 I totally understand wanting to get in and out of the kitchen quickly…believe you me I feel that way VERY often! It is fun every once in a while to relax and spend the day baking food for the people you love…it’s SO worth it! My husband only has a few left in the fridge and I think he may cry after he eats the last Eclair and realizes they are gone! These look increeeeeeeedible! 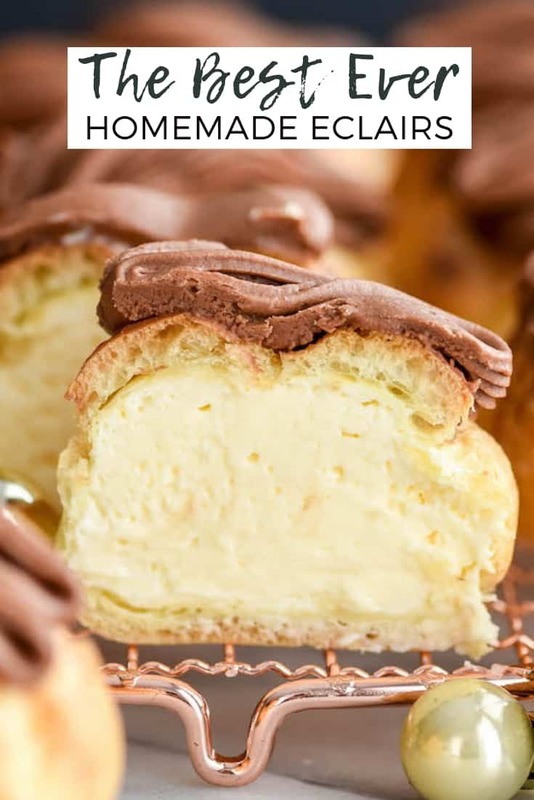 Gluten free eclairs are on my “must master” list, however, I always seem to experiment with other things as they’ve been on the list for a while! These look so delicious. Can’t wait to try them! Thank you Anna! They’re really fun to make, especially on a rainy day! LOL Vanessa!!!!! That’s the trouble with these guys…they’re so light and airy you can’t (like not even possible) just eat one! Oh wow! I love eclairs and these look AMAZING! Will definitely have to try! Oh my goodness these look mouth watering! Thank you Ashleigh! These are my husband’s favorite dessert of all time, and his mom’s tried and true recipe! These look amazing! Quick question, for the frosting the recipe show 4 oz 1 cup of unsweetened chocolate, can you clarify the correct amount? Hey Diane! 4 oz = 1 cup chocolate chips! I will clarify that on the recipe! Thank You! I made these today and all rave reviews! My neighbor boys were over too and they said this is the best dessert ever! We will be making these for all the special occasions, and the regular days too! Ohhhh my goodness! My family was blown away with these delicious lil morsels! I’ve never made eclairs, I thought to myself “well, she says you will get some that don’t puff but not to waste them (oh, trust..I wasn’t!) Totally thought since this is my first time, I’m probably going to have more than a few flat. NOPE! Dead serious, not one was flat! They are so beautiful and so delicious, my husband and boys can’t stop eating them. 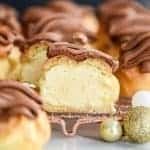 So, as I’m writing this review I have a batch in the oven of just “bite size!” Because, I’m afraid we will all become a bunch of cream puffs if they devour the rest lol. Going to deliver some to my sisters family tomorrow because this recipe makes plenty to share! Perfect recipe, will def be making again! PS, wish I could post a pic, they’re so cute! First pan fell flat, so thin. 2nd pan I made thicker ones. Hey Nicole! Can you give me a few more details? Did you follow the recipe exactly? Why kind of pan are you baking them on and in what kind of oven?